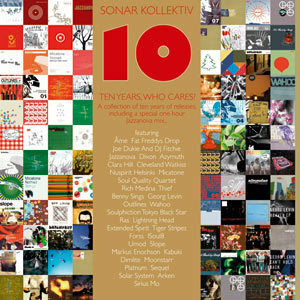 Various - Sonar Kollektiv 10 Years - Who Cares? Bel humour pour l’équipe des JAZZANOVA qui fête les 10 ans de leur label SONAR KOLLEKTIV. A cette occasion ils nous proposent UN ALBUM DOUBLE AU PRIX D’UN SIMPLE avec un premier CD constitué de 20 perles du labels dont OUTLINES, SOULPHICTION, DIMLITE, FAT FREDDYS DROP, JAZZANOVA ou encore BENY SINGS. Le second CD est UN MIX des JAZZANOVA qui reflète parfaitement ce que l’équipe joue en club : ÂME, EXTENDED SPIRIT, WAHOO, KABUKI ou encore SLOPE. Almost unbelievable how time flies by! Sonar Kollektiv was founded in 1997 by the constantly subversive DJ/producer team JAZZANOVA who are this year celebrating ten years of their label. 10 years might but it's a veritable age in the fast moving world of the music business, and considering the continually changing musical landscape, it is all the nicer that the unique concept of Sonar Kollektiv is still growing and bearing new fruits. 10 years of Sonar Kollektiv simply means 10 years in which the JAZZANOVA members ALEX BARCK, CLAAS BRIELER, JÜRGEN V. KNOBLAUCH, AXEL REINEMER, STEFAN LEISERING and ROSKOW KRETSCHMANN have been appearing as a multi-faceted and powerful formation. Through their great international success (countless DJ gigs, compilations, remixes for 4HERO, INCOGNITO, MARCOS VALLE, TRÜBY TRIO, their own album, production for various other artists and radio shows), JAZZANOVA have established the basis for Sonar Kollektiv. These achievements speak for themselves and form the basis for an ever growing network. Of course, a label isn't just made up of its founders but also out of the artists for whom the label offers a creative platform. Through their tireless A&R work - always eclectic but still bound by definite goals - JAZZANOVA have managed to gather a roster of artists around them who, with their high quality of output, have also managed to enjoy worldwide fame: CLARA HILL, FAT FREDDYS DROP, SLOPE, ÂME, MICATONE, TRICKSKI, these are just some of the many Sonar Kollektiv artists who expand the boundaries in their respective genres and are rightfully respected. The label has always concerned itself with 'the space in between' and opened doors which maintain a balance between underground eclecticism and music that reaches out to a wide audience. Not for nothing is Sonar Kollektiv known as the only 'dance label that doesn't actually release any dance music'. It's not just about functional DJ tools (although these are of course part of the labels' back catalogue), rather musical pieces with song character - music which doesn't just focus on the bare minimum but on club goers, the listener and those who like to enjoy the music on other levels. So what could be more appropriate than celebrating this anniversary with a musically all encompassing compilation? The double CD set reflects again the label founders two pronged strategy; CD1 is packed full of 20 musical pearls while CD2 is a DJ mix by JAZZANOVA, showing the club orientated aspects of Sonar Kollektiv which have always played an important role. It must have been a struggle to select tracks from the entire label catalogue. One thing is for sure, the labels' strategy comes through; old tracks are found along side brand new material and sound no less fresh than at the time of first release. This consistency proves itself on other levels as well - many of the original artists are still with the label and they are now important figures. Some of the highlights on CD1 include tracks by FORSS, MICATONE, JOE DUKIE, OUTLINES, DIMLITE, THIEF, JAZZANOVA as well as BENNY SINGS, while CD2 contains (among others) tunes from ÂME, EXTENDED SPIRIT, WAHOO, KABUKI and SLOPE. These are tracks which will also be presented live in autumn 2007 by the Sonar Kollektiv Allstars Orchestra which is currently being assembled by VOLKER MEITZ, complete with backing band, string section and all the business. These two perspectives on the same selection of songs will confirm another important fundament of the label; Sonar Kollektiv has always been at the meeting point of analogue and digital, organic and electric. Here's to the next 10 years!